It’s 10pm on Thursday night. I’m sitting in Fred Meyer back in Anchorage trying to get this post done before they lock the doors in one hour. 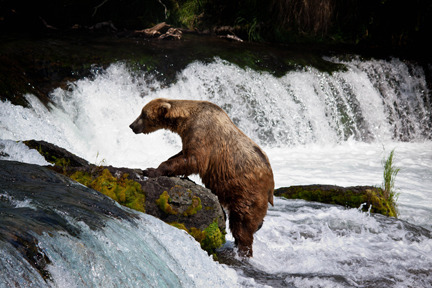 I just returned this evening from Brooks Lodge in Katmai National Park. To say it’s “FANTASTIC” is an understatement. It was everything I was hoping it would be. In this post, I’m going to show you some pictures with very little text. Just enough to explain what’s going on. Tomorrow, I’ll show you more about Brooks Lodge itself and my trip there and back. I got to Brooks Lodge about noon yesterday, Wednesday, and after a 20 minute presentation on bear safety, I dropped my backpack in my room and headed for the viewing platforms. It’s a hike of about 1.2 miles. 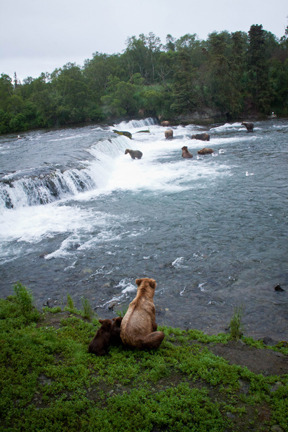 During the course of the day…ending about 8pm…I saw 13 bears on the river at one time including a Mom and her two cubs. Many are regulars. They come to fish and each seems to have their own technique. 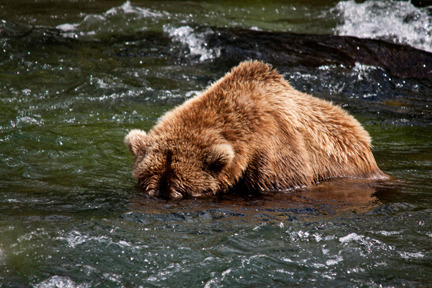 Some bury their heads underwater looking for salmon. And then surface to survey the area. Some stand to survey the area. 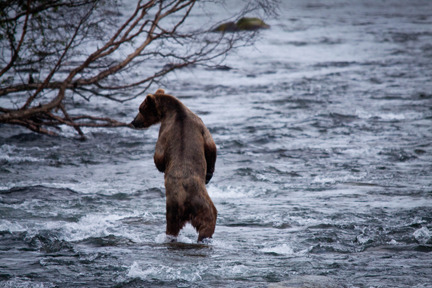 Some carefully study the river…. 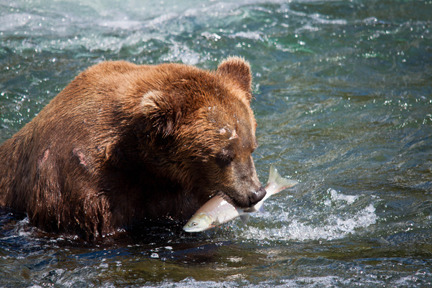 They all come for one thing…salmon. 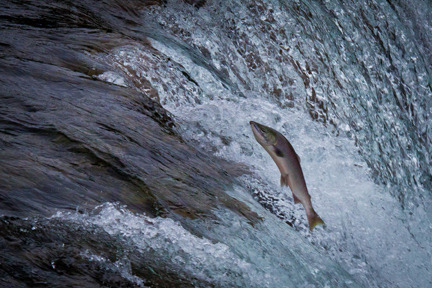 The salmon are headed upstream to spawn. Here’s one that made it over the falls…. And here’s one that didn’t. There’s no question that Brooks Lodge was the highlight of my trip so far. 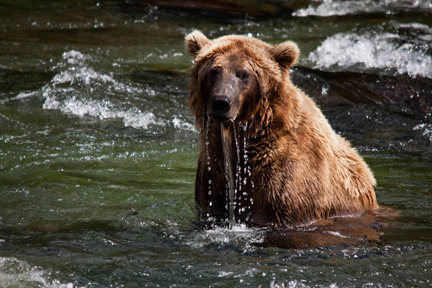 I made this trip to photograph bears in the wild. I was constantly amazed by the fact that I could get this close safely. 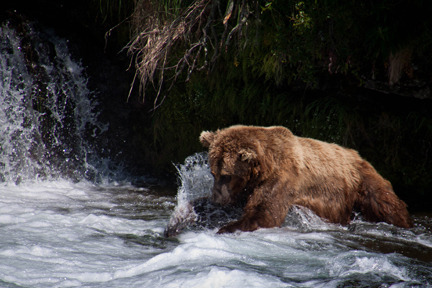 Not only did I see bears in the river, as a reminder that this is their territory, I encountered bears on the trail to and from the lodge. Yesterday, I was walking back to camp when I came upon a couple from Maryland stopped in the middle of the trail. As they were walking, the man’s wife with her head down watching where she walked, nearly walked upon a bear until her husband stopped her. There was a bear stopped in the trail ahead of them. When I got there, the bear had moved on. The three of us had two more cross the trail about 50 yards in front of us as we continued. Also, last night one walked through the cabin area while one of my neighbors set out on her porch. And this morning at breakfast a bear walked down the same path several of us had used to get to the dining hall. 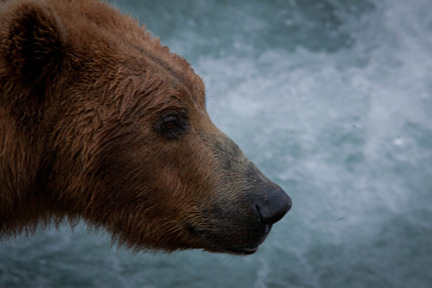 Rangers are everywhere to alert us and close the trail and a bridge between the lodge and the viewing platforms in a bear or bears are seen to close to us. They patrol the beach where the float planes land and throughout the camp area. Ganted, these bears are pretty well habituated to people but I would just as soon not test their tolerance for us. It’s been two long, exhilirating days. I’m going to find a place to retire for the night and tomorrow I’ll have another installment. It’s 10:30 pm Alaska time, 11:30 on the West Coast, 1:30AM for my friends in Kansas, Oklahoma and Texas and 2:30AM for you good people on the East Coast.